Sampson Lewkowicz: "Mayweather vs. Pacquiao was lost because of ego. I hope that is not the case with Martinez-Cotto"
It is one of the most anticipated match ups in boxing, Sergio Martinez vs. Miguel Cotto. It is a fight that has been talked about on and off for the past few years, but with Cotto’s recent return in October in which he looked impressive by quickly stopping Delvin Rodriguez, talks heated up again and it seems this fight could become a reality if the camps can come to terms. In this special “On The Ropes” interview, I speak with the manager of Sergio Martinez, Sampson Lewkowicz to discuss the potential Martinez vs. Cotto bout and get his thoughts on Sergio’s return to boxing after a long lay off and surgery. Sampson also talks about Martinez’s last fight against Martin Murray and why his fighter got injured in the match. Additionally Lewkowicz gave his views on who will be to blame if the Martinez-Cotto fight does not happen, and how that fight compares to the one that never happened, Mayweather-Pacquiao. Here is what Sampson Lewkowicz had to say. Jenna J: Sampson, there has been a little hang up in the negotiations for the Martinez-Cotto fight. If Sergio Martinez doesn’t get the fight with Miguel Cotto, do you think he’s still targeting coming back at around June to be fully healed? Sampson Lewkowicz: Yeah, maybe in May, or June. Jenna: Well, seeing as Sergio had surgery on his knee again after his last fight, he hasn’t gone back to the gym yet and had a chance to test it out. Is that something that once you get him back to the gym you’re truly gonna know the time table? Lewkowicz: Yeah that will most likely be in the month of February. He will go back when he finishes all his treatment on the last week of January, the doctor will give him the results and depending on the way he’s feeling, but he’s feeling very good. Jenna: What options out there do you see for Sergio if the Cotto fight falls through? 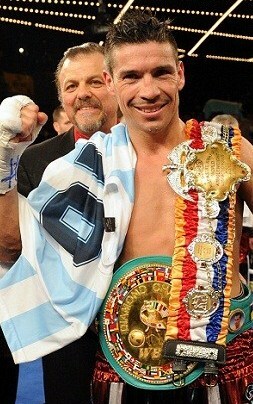 Lewkowicz: Well most likely he would fight in Argentina, because the people will like to see him again. Jenna: There have been many rumors regarding Sergio’s last fight saying he was not fully healthy going to it. Did he mention anything to you before that bout? Lewkowicz: No, that’s not true. He fought before with small minor (injuries) but regardless, he’s a warrior that will fight and will never tell you the truth if he’s hurt or not, but Martin Murray he went in with the plan to hurt the knee. It’s very hard to see it on TV but if you were ringside, you would see that every time that he clinched, he hit him knee against knee. Even though he denied, we have pictures that show that the knee got in contact many times during the fight, he did it on purpose. It was like Martin Murray was the local guy, doing all kinds of fouls and infractions and the referee didn’t put attention on that.